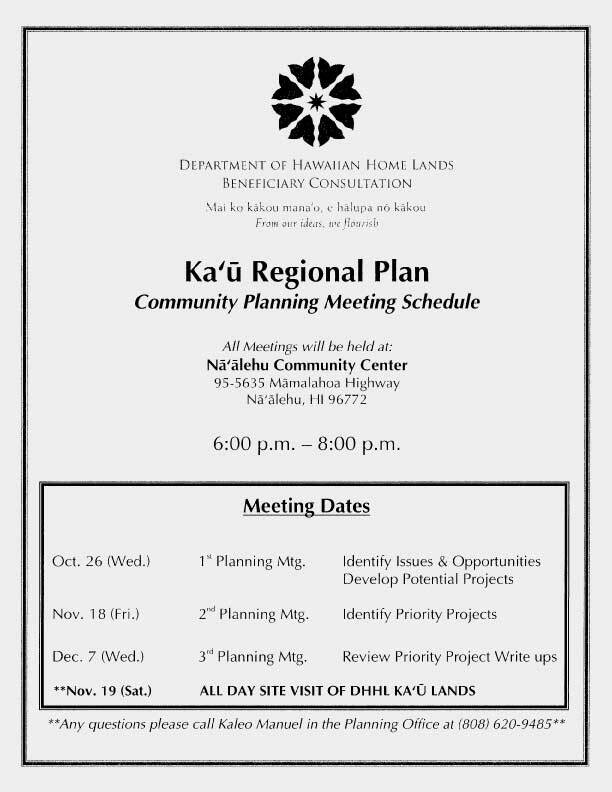 The Planning Office will be developing the Kaʻū Regional Plan. The Region will cover DHHL lands in Wailau (above Punaluʻu), Discovery Harbor, Waiʻohinu, and Kalae (Kamaʻoa & Puʻueo). If anyone has any information on our lands in Kaʻū or knows of any existing or proposed projects related to the region, please let us know so we can incorporate them into the plan. If there are any key stakeholders you feel we should meet with please let us know as well. Please see the attached letter and flyer that will be mailed to our Kaʻu lessees and applicants living in the Kaʻu region. The Department of Hawaiian Home Lands (DHHL) invites you to participate in a series of meeting with beneficiaries, both lessees and applicants living in the region, of Ka‘ū in order to develop a regional plan for Ka‘ū. The purpose of this plan is to work with beneficiaries and other stakeholders in the region to stimulate partnerships for the development and improvement of HawaiianHome Lands and surrounding areas. The planning meetings are opportunities for you to share your mana‘o on ways to improve the region. The Ka‘ū Regional Plan will be one (1) of twenty-one (21) regional plans the Department is developing statewide. Regional plans help the Department to develop partnerships, secure funding, and coordinate action in each region. The regional plans also identify key priority projects that are defined and implemented by the Department and the community. All meetings will be held in the evenings from 6:00 p.m. – 8:00 p.m. at the Nā‘ālehu Community Center (95-5635 Māmalahoa Highway, Nā‘ālehu, HI 96772). We are also planning an all day site visit of DHHL Ka‘ā lands on November 19 (Saturday). Please see the attached flyer for more information. Remember, this is a planning process and not just a single meeting so please try to attend as many meetings as possible and contribute your mana‘o to make Kaʻū region a thriving Hawaiian community. Your participation will make a difference. If you have any questions, please contact Kaleo Manuel in our Planning Office at (808) 620-9485 or email [email protected].